There are several ways to start Cage Builder, a tool in the Higher-Order Structure category. Attach polygons with [ 3 ][ 4 ][ 5 ][ 6 ][ 7 ] sides - clicking a number attaches a new polygon of the specified shape to each currently selected polygon edge, or if no such edges exist, creates a single new polygon. All polygons are part of a single Chimera marker model named Cage. The attached edges are automatically joined. Joined edges are shown in lighter colors than unjoined edges. Clicking Minimize improves the alignment of joined edges. This is typically done after some rounds of new polgyon attachment. Clicking Delete removes entire polygons that contain any selected edge or vertex. Close simply dismisses the dialog, and Help opens this manual page in a browser window. [ Join ] or [ Unjoin ] selected polygon edges - clicking Join when exactly two edges are selected will join those edges. The two edges should belong to different polygons, and a polygon will be relocated as needed to attach and join the edges. Their previous join partners, if any, will become unjoined; an edge can only be joined to one other edge at a time. Clicking Join with fewer or more than two edges selected has no effect. Unjoin will unjoin all joined pairs with one or both edges selected. Join polygons so that [N] edges meet at a vertex (default on) - whether to automatically join additional edges during new polygon attachment or when Join is used, with the constraint that N edges (default 3) should meet at each vertex. For example, if a lone pentagon has all of its edges selected and the 6 button is clicked, not only will a new hexagon be attached (adjacent edges joined) to each side of the pentagon, but also each hexagon will be attached its neighboring hexagons. Polygon positions may be adjusted to accommodate joining. If this option is off, only the edges of new polygon attachment will be joined automatically. [ Set ] edge length [e] thickness [t] • inset [i] (default on) - clicking Set or changing a value and pressing Enter (return) updates all polygons in the cage model to the specified edge length (default 1.0) and stick thickness (default 0.2) in physical units, typically Å. With insetting on, the edge lengths are reduced by the inset value (default 0.1) so that the edges of attached polygons will not overlap completely. For well-aligned joined edges, using an inset equal to half the thickness makes the sticks representing the edges lie side by side. With insetting off, the polygons are shown at the nominal size with attached edges right on top of each other (to the extent allowed by geometric contraints). The length, thickness, and inset settings will also be used for subsequently created polygons. [ Expand ] cage by [g] times edge length - clicking Expand or changing the value and pressing Enter (return) fattens the cage by moving each polygon outward along its normal by a factor g (default 1) times edge length, keeping polygon sizes the same. Subsequently clicking Minimize will bring the polygons back together, often leaving the whole cage with a rounder shape. This option has rather limited usefulness. Create [ Mesh ] model from cage polygons, color (a color well, by default a dark gray) - clicking Mesh generates a new marker model from the existing polygons, in which attached edges are replaced by a single edge and attached vertices are replaced by a single vertex. The mesh model cannot be edited or resized with the Cage Builder dialog; all editing should be done with the polygon cage model. 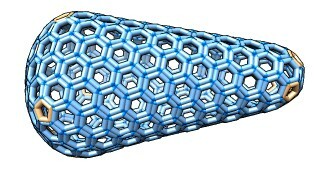 Copies of molecular models can be placed on each polygon using the sym command. The copies can be removed with ~sym. The additional arguments in the second example specify creating low-resolution multiscale surfaces instead of atomic copies (for faster rendering) and updating their positions when the original copy of the molecular model is moved relative to the cage. Currently there is no good way to refine the molecular positions so that interfaces between molecules are physically realistic.